Modern versus postmodern Adventism: The ultimate divide? When did modernism give way to postmodernism? It is impossible to pinpoint the beginning and the end of any era in a precise manner. Just as it was not immediately clear when the "Middle Ages" ended and the "modern" period began, so it is with the far-reaching transitions and thought trends of our time. Only the perspective of history can provide a reasonably clear picture of such mega trends. So the fuller picture of what is now happening to our world will become clear only gradually, but that something is happening and that the world is in major transition is beyond any doubt. When we use the word "modern" or its derivatives to refer to the period that followed the Middle Ages, we do so in a particular way. It is a label for the Enlightenment Project that got underway when people began to think differently, as the Cartesian approach to philosophy began to sink in. Descartes' famous dictum "I think therefore I am" became the foundation for a new way of looking at humans and God. The autonomous human, endowed with reason, and soon also fortified by the new scientific method that was developed by Francis Bacon and Isaac Newton, became the measure of all things. The human was going to solve the world's problems. God was at a distance, while the recently discovered laws of nature kept the uni verse going in an orderly manner. The future would be marked by continuous progress, as the enormous resources of this planet were increasingly exploited to human benefit. Toward the end of the nineteenth century and in the early twentieth century, the Enlightenment Project was beginning to run out of steam, as Friedrich Nietschze and Sigmund Freud came on the scene. New philosophical approaches that focused on language and the interpretation of texts began to blossom. They began to deliver a message of relativism, uncertainty, and even pessimism. The Holocaust, if anything, made it impossible for life to continue as before. Philosophers in Europe and in the United States began to emphasize that the time of such grand narratives as Marxism, Communism, and Christianity had been eclipsed. They declared that there were no longer any all-encompassing schemes that offer a comprehensive explanation of life. Instead, they said, there are only fragmented and contradictory smaller stories of individuals and groups in all their diversity. All is difference, they pro claimed. And all judgment needs to be deferred! There are no absolutes; Truth has been replaced by truths. From the 1970s onward the term postmodernism came into use to describe the changes that became more and more apparent in the arts and in architecture, and then also in philosophy and even theology. Today the term has become a catch-all label that can be attached to almost anything. But though, admittedly, the term is imprecise and postmodernity means different things to different people, it cannot be denied that something is going on, particularly in the Western world. The Enlightenment era has come, or is rapidly coming, to an end, and we participate, whether we want to or not, in a momentous process of change. What is a postmodern person? What does he or she think? What do they do? Where are they to be found? There is no shortage of books that list the main characteristics of the postmodern man and woman. Most authors will indicate that there is a superficial kind of postmodernism, which is almost synonymous with consumerism and hedonism, and which allows its adherents to live most of their lives in a virtual world. But there is more to it than that, and in most cases this description would be unfair. Rather than describing the average postmodern person as a gadget-happy, amusement-seeking, shallow individual, metaphors like nomad or flaneur might be more apt. It should also be said that there is often an interesting mix of modernity and postmodernity in one person. Below are some of the most notice able characteristics of the postmodern approach to life. These are given in an abbreviated, summary form, and the list is by no means exhaustive, even though it is helpful in understanding or recognizing postmodern trends. 1. The postmodern person does not believe that everything will become better and better. The idea of progress is largely abandoned. Science is not seen to be the unconditional blessing it once was thought to be. 2. There are no absolutes. We all have our own private truths. Communities and cultures have their own language games. What they talk about and believe in does not necessarily relate to any one particular reality. Everything is subjective, relative, uncertain, contingent, and ambiguous. 3. The metanarratives (grand stories) and the grand ideals have disappeared. 4. Postmodern people like a juxta position of incompatible elements. In art we find a great interest in collation, mixing of artistic styles, a blurring of the lines between real life and fiction, the real and the virtual. 5. Scientists are becoming more modest in their claims and confess that they often see what they want to see, and that many of the so-called foundations of science may not be so certain after all. 6. People know they live in a global village. The computer a symbol of postmodernity gives them instant access to the world. Yet, at the same time, global strategies and alliances are under suspicion and there is a strong interest in regional and local issues. 7. The postmodern person has a strong dislike for religious institutions but is open to spirituality. In fact, some advocate a re-enchantment of the world. Mystery is OK. The nonrational, new age-type approach to the questions of life is popular. Once we become aware of the main characteristics of the postmodern mindset, we see the impact of post modern thinking everywhere. Look at some recent buildings in western cities: no longer the modem boxlike monotonous structures of concrete, steel, and glass. Ornamentation is coming back and styles from different periods are combined, so that post modern buildings can tell their own story. It is easy to detect the postmodern trends in many recent novels that blend stories from different periods; in films that leave a person wondering where the historical ends and the fiction begins. This is seen, for example in the "infotainment" and "docusoaps" of the latest television productions. We also find postmodern ambiguity in the political arena, as, for instance, in parts of Europe where a majority of the people support the idea of a European unity but at the same time will do anything to protect a local dialect. Further, one quickly detects the postmodern approach of many Western people to religion and to the church. Religion is in, but the institutional church is out. Experience and emotion are OK, but doctrines are considered largely irrelevant. Absolute, propositional truth is replaced by what works for me, and there are as many legitimate ways to interpret the Bible as there are readers. Christianity is one religious option among a series of world religions all are equally valid, historically and culturally conditioned responses of the human self to the "Beyond." Sin has been reduced to a sense of regret that things have not gone as expected, with little or no place for something like atonement, where Someone steps in on my behalf. More often than not, those who do turn toward Christianity want to pick and choose as to which teachings they are willing to accept, and will often be reluctant when it comes to manifesting full and permanent commitment. The postmodernism wave has not bypassed the Seventh-day Adventist Church. Many of the issues and concerns, particularly in the Western sectors of the church, are directly related to postmodern influences. Clearly, for a growing number of Adventist believers in the West the metanarrative of Adventism as a worldwide, divinely ordained movement, united by one theology and one organizational model, with uni form programs and resources, has outlived its sell-by date. More and more church members tend to think and act locally. They have little or no interest in the church's hierarchy and are suspicious of centralized institutional structures. Many are increasingly weary of doctrinal fine print and establish their own truth, largely, but not exclusively, within the framework of Adventist tradition. They tend to regard Adventism as one option among other options and are not so sure that their traditions are the one and only true church. Worship styles have significantly changed, with an increasing emphasis on experience, and on contemporary music, drama, and informal small group meetings. Traditional church discipline has lost much of its corrective power, and an increasing amount of spiritual cross-border shopping takes place. It has often justifiably, I think been noted that Adventism has an underdeveloped ecclesiology. This fact will increasingly haunt us, as this happens to be the arena where many of the postmodern questions of our church members are asked. What is the church? Is it the church universal! Is it the visible, historic, institutional church, or the invisible church of all ages? Or is it a small remnant, with a message that changes in emphasis and focus as one Christian era gives way to the next? All these questions are directly related to our Adventist identity. Is the Seventh-day Adventist Church the only true church and are all other Christian organizations to be labeled as Babylon? Or is Adventism simply one option beside a whole gamut of other Christian options, which may be just as valid? Or perhaps Adventism, it may be thought, represents something special, an option that offers a series of insights not readily available else where? The question for some influenced by postmodernism may be, Does Adventism possess the absolute truth in all areas of theology, or should we be a little more modest and claim at most that our church makes a significant contribution to the rich diversity of Christianity? There is much confusion and dis agreement about the answers to be given, and the response one gives is largely determined by whether one is a modern or postmodern Adventist! Categorizing people is dangerous. Most people simply do not fit neatly into any one category. This is also true when we try to separate modern from postmodern Adventists. So, we must remember that the profiles given below are inexact and are, at least to some extent, caricatures. But, nonetheless, they are basically true in outline. The modern Adventists are in the majority, and will be for some time to come. They are found wherever there are Seventh-day Adventists. They are the traditional Adventists, mostly conservative in their beliefs and in the way they view their church and the surrounding world. They believe in the grand story (the "metanarrative") of Adventism as God's "remnant church," with its worldwide mission mandate, called forth by God at the appointed time and assured of its ultimate success. Modern Adventists believe in absolutes. They dislike questions that may undermine the certainties of the believers. They defend the historical positions of the church with regard to doctrine, organizational structure, worship, and ethics. They welcome a strong emphasis on eschatology and are staunchly anti-ecumenical. They hold a very "high" view of inspiration, both with regard to the Bible and Ellen G. White. They are strong on policy and on the church manual. They want their church to remain united and believe that this unity is fostered by uniform programs and a solid central system of governance. But postmodern Adventists are a growing minority, in particular in Western countries: the United States and large parts of Europe and Australia, with smaller groups in other parts of the world. They tend to be well educated and tend to be in more affluent areas. They do not have the same interest in the metanarrative of Adventism as their "modern" brothers and sisters. Their focus is much more regional or local. They are often suspicious of the church's hierarchy and, as previously mentioned, are simply not interested in the upper layers of the church's organizational structure. They are weary of ecclesial authority and do not unduly worry about church discipline, policy, or the church manual. They tend to allow for diversity in doctrine, and want to pick and choose which of the 27 fundamental beliefs of the Church they will embrace. Their religion is much less rational than traditional Adventism. Experience, celebration, praise, and Holy Spirit are the catchwords for the way many of them want to "do" church. They are open to outside influences, even tend to engage in some cross-border shopping, for they usually view other, in particular evangelical, Christians in a much more positive light than modern Adventists do. The postmodern Adventist will often tend to postpone or have reservations about making a total commitment to the church and its message. Postmodernism in and outside the church confronts the church with a set of tremendous challenges. How does the church stay together when people operate on sharply differing premises and no longer see eye to eye regarding the identity and mission of the church? How do Church leaders relate to those who have different ideas about the importance of doctrine as such, and with regard to particular fundamental beliefs? How will the institutional church worldwide be affected by the growing disinterest in the church's organizational structure and global programs among a relatively affluent segment of the church? Must these trends be judiciously welcomed, or must they be strongly rejected and fought tooth and nail? Or is there some middle road? I would suggest that we should not come to hasty conclusions. Both modernism and postmodernism have facets that are in tension with the gospel of Jesus Christ. The old question of the relationship between culture and gospel has reappeared in a new garb. It is, of course, important that the gospel address the issues raised by postmodern people and that those who proclaim the gospel are sensitive to the ways in which people think, feel, and react. At the same time, every culture including postmodernism must be judged by the biblical gospel. We need not and we must not uncritically accept the pluralism and relativism of postmodernity. The claim that all "grand stories" have been eclipsed cannot deter us from proclaiming the metanarrative of our Lord Jesus Christ. Postmodernity has facets that dangerously undermine the core of the biblical message and the certainty of salvation, but it also offers great opportunities. Because of the basic attitudes that are part and parcel of postmodernity, once again it is all right to talk about religion. 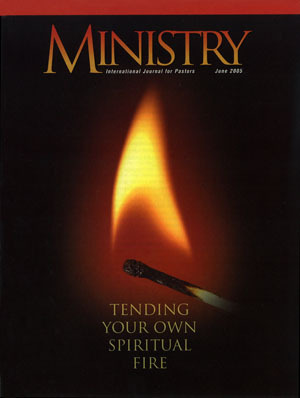 There is a new thirst for spirituality and are markable openness to the supernatural. There is more willingness than in recent decades to listen to the small stories of those who have encountered Jesus Christ. A crucial question is, How can modern and postmodern Adventists stay together, dialogue together and grow together, and worry together about the essential content of the biblical message rather than about the cultural forms in which the gospel message is preached and in which the institutional church operates? Will church leadership allow for such dialogue, or even encourage it? Or will it try to protect its "modern" achievements at any cost? The Truth is only in Christ Jesus. But could it be that there are modern as well as postmodern truths that may help us to discover ever more of the Truth? Only as we learn to listen to one another, as we understand that we live in a time of transition (or is it the time of the end? ), and as we continue to seek answers that are relevant to our contemporaries through an open-minded and Spirit-directed reading of the revealed Word only then, I believe, will we be able to nurture our modern or postmodern soul, build the church we love, and dis cover ways of reaching out to both the modern and the postmodern men and women around us. Many of us differentiate between conservative and liberal Adventists. That may, however, turn out not to be the most significant classification. Modern versus postmodern may well be the most challenging division among us. May God make us wise and deter mined to stay together, as He shows us the way to create reliable bridges across this new and challenging divide.